Etude House 0.2 Therapy Air Mask is a hypoallergenic mask, made extra thin so that your skin can breathe while it embraces your skin tighter for better absorption of the active ingredients. The Lotus type (soothing and puriffying), is just one of the series of the 0.2 Therapy mask which can be used as a daily sheet mask. 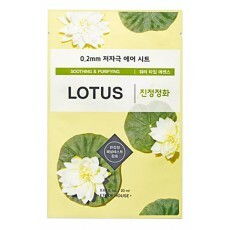 contains lotus extract 2500 ppm in a moist water type essence. It is fresh and light. Etude House 0.2 Therapy Air Mask is a hypoallergenic mask, made extra thin so that your skin can breathe while it embraces your skin tighter for better absorption of the active ingredients. The Calendula type (soothing and skin radiance), is just one of the series of the 0.2 Therapy mask which can be used as a daily sheet mask.